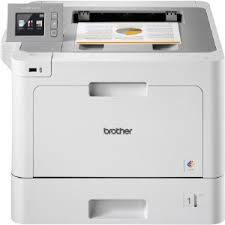 The Brother HL-L9310CDW color laser printer is an excellent choice for mid-sized workgroups with demanding print volumes that need a low total cost of ownership and reliable, business quality output. In-box 6,500-page toner cartridges offer built-in value, and ultra high-yield 9,000-page replacement toner cartridges offer low cost output‡. This high-performance printer helps to increase your productivity with print speeds up to 33ppm and a 2.7" Touchscreen display for easy navigation and direct printing from popular business cloud services‡. Scalable for virtually any office, add either optional trays to increase capacity to 1,300 sheets or transform this printer into a floor-standing model with the tower tray option (520 sheets x 4 trays). Advanced security features offer network user authentication and help limit document and device access.